Roamer was an American thoroughbred racehorse. In the Blood-Horse magazine's list of the top 100 U.S. thoroughbred champions of the 20th Century, the gelding Roamer was ranked #99. Roamer's father was a "teaser" stallion named Knight Errant who jumped a fence to get at Rose Tree II, a blind English-bred claiming mare—hence the name of the unexpected ill-bred foal, Roamer. Or perhaps it was the blind mare who jumped the fence. Either way, the result was a small bay born in 1911 who was gelded almost immediately. Roamer was bred, if you can call it that, in Kentucky by the sons of Col. Ezekiel F. Clay of Runnymede Farm who'd sent out some of the best of America's 19th Century champion racehores: Hall of Famer Ben Brush, winner of the 1896 Kentucky Derby, Hall of Famer Hanover (topped the U.S. sire list 4 times), Runneymede (second in 1882's Derby behind Apollo), and Hall of Famer Miss Woodford (1st US horse to go over $100,000 in earnings). Roamer raced for the Clay brothers as a two-year-old. One of the brothers recklessly entered him in a $1,000 selling race, only to see him claimed, and had to buy him back for $2,005. He was then sold for $2,500 to New York City publisher, Andrew Miller, the secretary/treasurer of Saratoga. (Miller, one of the founders of Life magazine, was a classmate of Teddy Roosevelt at Harvard, and in 1900 helped purchase and revive the Saratoga Race Course.) At that point, Roamer's training was taken over by A. J. "Jack" Goldsborough. Thus began his glory days. Roamer had 98 starts. He won 39 of them, came in second 26 times, and finished third nine times. His career earnings were $98,828. He could run short races, and long. Any surface suited him. He carried up to 133 pounds and broke more track records than any other American racehorse up to his time. Roamer ran his rivals into the ground. In race after race, he set the pace and raced home with it. Roamer could carry his early speed. Reading descriptions of his races, it says "he cantered home," or "won easing up." At the ages of three and four, he was the undisputed champion. He won the Saratoga Special Stakes, the Carter Handicap (against older horses and setting a track record), the Brooklyn Derby (an 8 length rout), the Midsummer Stakes, the Travers Stakes (a ten length romp while setting another record), the Huron Handicap, the State Fair Stakes, the Municipal Handicap, the Autumn WFA Stakes, the Washington Handicap at Laurel Park Racecourse (giving away 22 pounds to the runner-up and breaking the American 9 furlong record), the Queens County Handicap (twice), the Brookdale Handicap (twice), the Saratoga Handicap (3 times), the Merchants and Citizens Handicap, the Saratoga Cup, the Havre de Grace Handicap, the National Handicap, the Yonkers Handicap (twice), the Excelsior Handicap, the Aqueduct Handicap, the Arlington Handicap, the Empire City Handicap, the Mount Vernon Handicap, the Pierrepont Handicap, the Edgemere Handicap, the Continental Handicap, the Pelham Bay Handicap, and the Domino Cap as an 8-year-old beating the French champion, Sun Briar. At that age he also beat another Hall of Famer, Old Rosebud. Roamer raced for seven years. 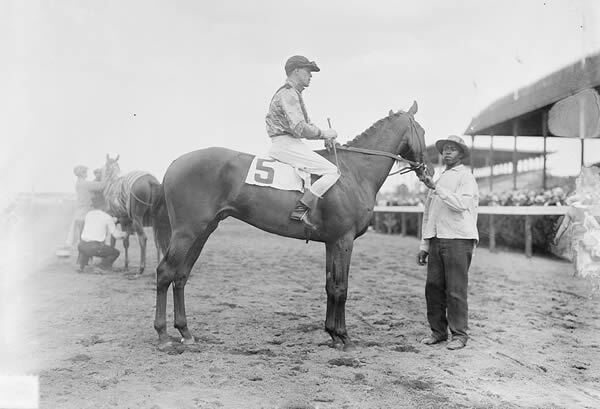 In 1914, he was the track's leading earner and was named America's Horse of the Year. Roamer died on the first day of the year 1920. On that New Year's Eve, his owner Andrew Miller suffered a fatal heart attack. Ironically, a few hours later, Roamer slipped on ice in his paddock and broke his leg. He had to be euthanized. His jockey for the last three years of his life, Andy Schuttinger, said, "He is as smart as they come, but is as honest as the day is long. He will give up to the last ounce of speed he has on tap." "His action is what makes him great," said his trainer. "I never expect to see another like him." Roamer was inducted into the National Museum of Racing and Hall of Fame in Saratoga Springs, New York in 1981.